Munster coach Johann van Graan departed Murrayfield on Saturday a happy man. The South African was thrilled with Joey Carbery’s contribution to Ireland’s hard-fought victory over Scotland and with Conor Murray’s form. 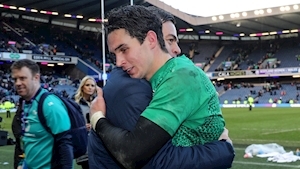 Van Graan was invited to Edinburgh as part of the official Irish party and immediately after the final whistle was photographed warmly embracing Carbery, who played a pivotal role when introduced as a replacement for Jonny Sexton. The Munster coach was not surprised at how Carbery bounced back after being caught for an intercept try shortly after his arrival. “Joey did really well in that second half to steer the game,” van Graan declared. “His goal-kicking and the line break for the try were excellent and I thought he defended well. I have gotten to know him over the last few months and he is a fantastic character with a lot of mental steel. Van Graan was equally satisfied with Murray, who has come in for hefty criticism in recent weeks and it won’t be forgotten that the South African took the Lions scrum-half out of the European Cup against Exeter Chiefs last month for “tactical reasons”. “No, I don’t think anybody should worry about Conor,” said van Graan. “He is a world-class player. Everybody is just expecting that he kicks every kick perfectly. I thought he put in a really big shift over the weekend in terms of his D and his reading and his passing. He scored a fantastic try. He won’t deliver the perfect performance every week, but that’s a world-class player. I don’t think he ever plays below 80%. No, he’ll find his way back into top form. I think it’s more the things that people don’t look at: He is so good in his support play and his communication. He makes teammates around him feel so good, so I think Conor is playing about 80% every single week and, hopefully, he’ll be back to 98, 99 soon. Van Graan clearly enjoyed his time with the Irish squad in the Scottish capital where, of course, Munster are due to meet Edinburgh in the quarter-final of the European Cup next month. Van Graan has been to Murrayfield with Munster, but he took the opportunity to have another look at the Scottish headquarters without placing too much significance ahead of the European Cup quarter-final. Chris Farrell, Niall Scannell, John Ryan and Billy Holland were yesterday released back to Munster by Ireland coach Joe Schmidt, while van Graan is confident Andrew Conway will return to action against the Kings on Friday night.